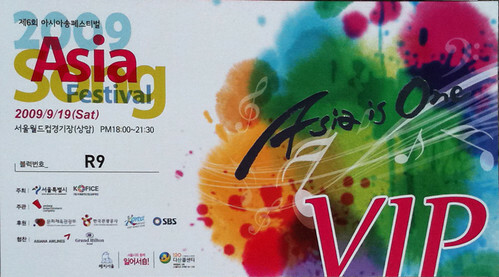 Some family and friends might find it just a little crazy that I would spend the better part of one of my few days in Seoul to attend a concert, but for me the Asia Song Festival was worth it for a number of reasons: great fan camaraderie, a chance to witness disciplined yet rabid fandom (oh those E.L.F.s! ), and a chance to see some of my favorite acts in action, plus discover some new ones. 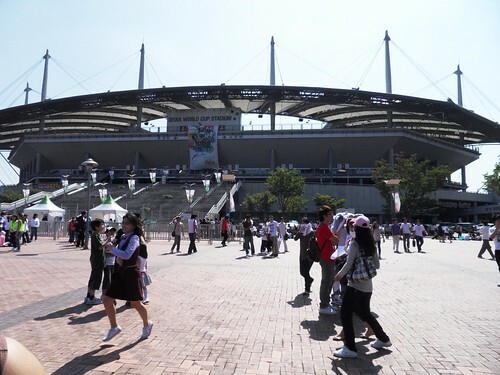 We got to Seoul World Cup stadium early, hoping to just pick up our tickets and check out some nearby attractions, but it was clear that this was a doomed plan once we learned how the seating arrangements worked. 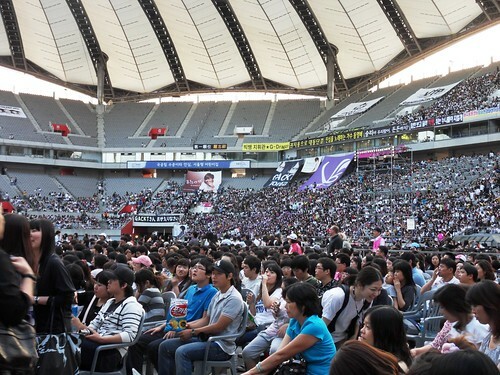 While we were in a close-in spot (group 9, thanks to being foreign fans from abroad), seats were not numbered and group sections were already lining up and being moved into staging positions around the stadium. Tossing lunch and sightseeing plans to the winds we joined in the queue for group 9 and found ourselves matched up with some lovely fangirls from Singapore who shared our enthusiasm for the various acts we’d be seeing as well as other areas of the Korean pop culture. So, even though we ended up having our locations moved around the stadium 3 times (once just so that they could film us in another area! ), waited without the benefits of seating or refreshments (may I say, marketing and merchandising opportunities missed here), eventually finding ourself underneath the stadium in one of the drive-up areas to the stadium, we entertained ourselves with conversation and watching video clips on my iPhone of favorite dramas and music videos. The concert did not play to a full house which was indeed a shame because it did feature a number of first-class acts and a number of top-rated ones (not always the same thing). The evening kicked off with a few videos urging the audience and viewers at home to pitch in and contribute to a charitable fund, then promos for tourism to Korea. As we were already there, does this mean it worked or was wasted on us? 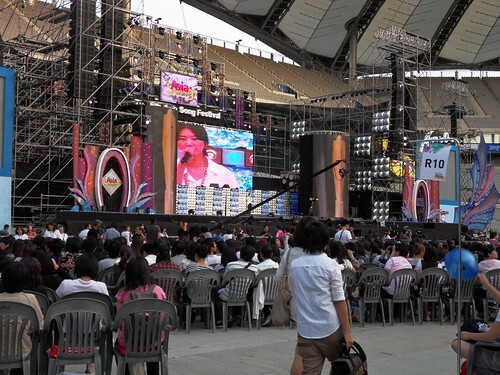 One thing I liked about the Korean concert-going public was their dislike of standing when perfectly good chairs are provided and their disapproval of anyone foolish enough to block their view. After our long hours of waiting, chair dancing was very much in our plans and this jived perfectly. What wasn’t so great was the way people kept sneaking chairs into the section in front of us, blocking the pathways and generally being a nuisance. However, we were close enough to not split hairs on this one. Another point of entertainment for me were the hours of people watching the long hours afforded me. It never gets old for me! The music and performances though were why we were there and they generally exceeded our expectations. (The less said about Roslana, the better.) We were delighted that Show Luo from Taiwan kicked off the main event and laughed to learn later on that he’d in fact been so nervous that he’d forgotten the lyrics to his latest hit song! Seeing “Little Pig” and his crew dance and sing some favorite songs got the evening started on a high note. It paid to be a foreigner… closer seating! 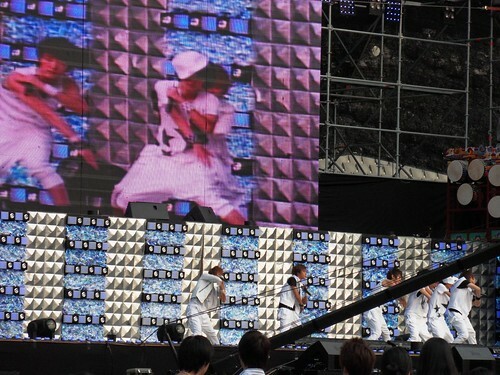 Other terrific performances were provided by Japanese groups Mihimaru GT and the special guest of the evening, V6. The legendary Gackt also thrilled us with two numbers, showcasing his unique style. The home team was well represented too by 2NE1, Girls Generation, Super Junior, and Big Bang, each group singing two of their most current hit numbers. Super Junior brought fans excitedly to their feet when they came back for an end of the concert encore to do their big hit, “Sorry, Sorry, Sorry.” I was happy for the (albeit brief) appearance of the delightfully intriguing Kim Heechul doing his few seconds of fun in the number! More pictures will eventually be available on my Flickr site. Check back for uploads as I go through my hundreds of files! Whoo hoo! 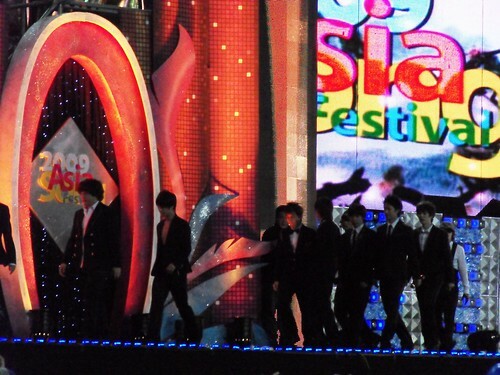 Asia Song Festival! Okay, to see Show Luo in concert would be great, but to also get to see Gackt, V6, Mihimaru (from Japan), and Big Bang, Girls Generation, 2NE1, and Super Junior (plus about 6 other acts) was just too much fun! And did I mention it was free AND we were in the “VIP” area? Great music and people-watching… Who could ask for more? Over the years I’ve fallen in love with an album (or twenty) and it played it with great regularity. But, as with many infatuations, the glow dims after awhile: new infatuations take over. Taste can be fickle. Sometimes it’s just a question of too many choices and you just have to listen to the one that is playing loudest in your head and imagination. “This is who is speaking to me here, right now,” you say to yourself.